As Wisconsin’s leading school of esthiology, our main objective is to prepare the student for the successful completion of the State Esthiology Board Examination administered by the Wisconsin Department of Safety and Professional Services. The student will receive a diploma certifying the successful completion of the esthetic course after 450 hours of study and treatment practice. Mondays 9:00 a.m. to 5:30 p.m.
Three Saturdays per month, 8:00 a.m. to 5:30 p.m. The Mequon Thiensville School of Esthetics is approved and licensed by the Wisconsin Department of Regulation and Licensing, PO Box 8935, Madison, WI. (608) 267-4854. 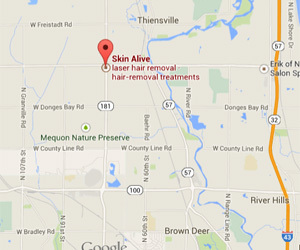 The Mequon Thiensville School of Esthetics is owned and operated by Skin Alive, Ltd., a Wisconsin corporation. Questions regarding the school program may be addressed to Gail Lerman, Director.